It’s one of the lessons they don’t teach in law school or in any of the scholarly tomes on legal jurisprudence. Until you learn it, you are doomed to fail: there are three parties to every lawsuit: the plaintiff, the defendant and the judge. And the man* in the black dress trumps the other two every time. 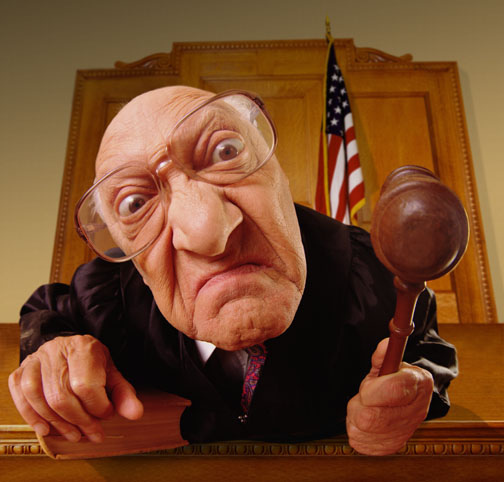 The bad judge can hurt or kill your case. He behaves like a tyrant. He interposes himself unnecessarily and tries the case for the lawyer, frequently losing it. He makes facial gestures to the jury, improperly and surrepticiously opining about the evidence in ways that won’t show on the record and, therefore, cannot be appealed. He doesn’t care whether justice is served, as long as he “moves” the case. He will pressure whichever side seems most pliable, regardless of the equities. He will “ice” the jurors by making them wait unnecessarily until they become so jaundiced by “the process” that the lawyers feel compelled to settle. He will unnecessarily berate an attorney, often threatening to hold him in contempt. He relishes the chance to harangue inexperienced lawyers. He doesn’t know the law and doesn’t care to learn it. He forces the lawyers to produce expert witnesses at times when the witnesses have genuine scheduling conflicts, thereby creating unwarranted and untenable animosities between the witness and the lawyer. He makes attorneys sit and wait for days to pick a jury thereby creating office management problems. In short, he promotes the sale of Pepcid, Pepto Bismol, Xanax and Prozac. Perry Mason, Boston Legal, L.A. Law, Law & Order miss the real action which frequently happens on the bench. Judges rule their courtrooms like feudal lords. The great ones are like Solomon: wise and courteous. The bad ones are stupid, lazy and/or nasty. Once a client gave me a sweatshirt imprinted with the words, “A good lawyer knows the law. A great lawyer knows the judge.” The lawyer who can’t tell the difference between the good and bad judges, is doomed. * Author’s Comment: the blogger takes literary license to use masculine pronouns so that the prose flows and does not cause the reader to doze.